When it comes to taking a family road trip from North Carolina, the first thing you'll need to do is make sure your vehicle is properly licensed and registered. If you're a new driver to North Carolina, registering your vehicle in the state is a relatively simple process, but you should be aware of the required documents and associated fees involved before you begin your registration. Of course, the first step to registering your vehicle in North Carolina is to first obtain a North Carolina driver's license, which will be required to process your registration. New North Carolina residents must register their vehicle when their previous state registration expires (in most instances 30 days) or when gainful employment is accepted in North Carolina—whichever happens first. After you move to Charlotte, Asheville, or anywhere in between, you can register your vehicle by applying in person at a Vehicle Registration and License Plate Renewal Office. In addition, you will also have to pass a yearly emissions inspection and pay an annual North Carolina Vehicle Tag and Tax Together fee for owning and operating a vehicle in the state. You can also register your vehicle at your local Division of Motor Vehicles office, and you can search by zip code to find the office nearest to your new address. Chances are you'll find one closer than the renewal offices. In some cities, the DMV also offers 26 Convenient Accessible Mobile Service (CAMS) vehicles that move between popular destinations. Proof of Identification: Applicants are required to present a valid North Carolina driver's license for registration. 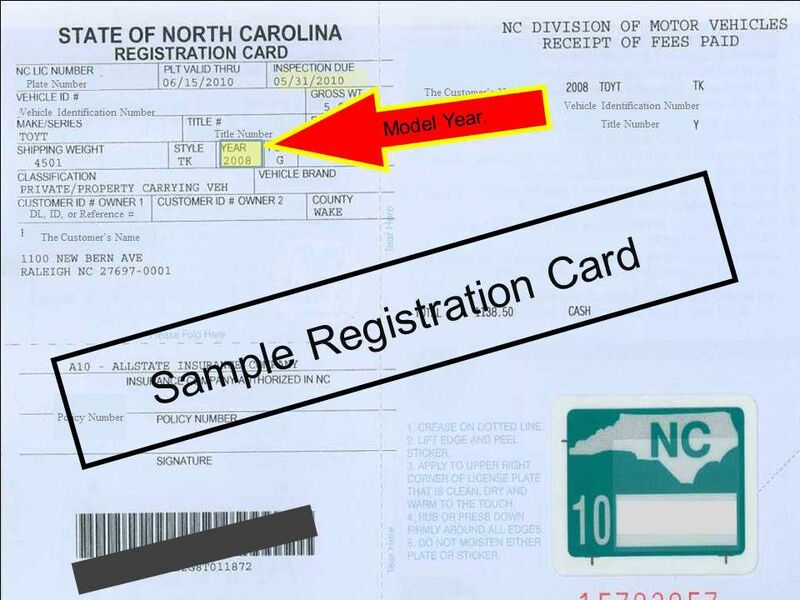 Another state's license may be accepted if the applicant can show that they are active duty military stationed in North Carolina, enrolled in a North Carolina college, possess a vehicle that is garaged in North Carolina for a minimum of six months; have a court-ordered sale of a vehicle; or are registering a motorhome or RV. New residents without a North Carolina license will be required to provide a valid out-of-state driving license and a North Carolina Temporary Driving Certificate (TDC). Proof of Liability Insurance: You must provide evidence of insurance covering $30,000 for bodily injury for one person, $60,000 bodily injury for two or more people, and $25,000 property damage. North Carolina law requires each company to notify the DMV when coverage has been canceled. Title of Vehicle: This document should be signed and notarized; other documentation may be required if the car is used or purchased out-of-state. Eligible Risk Statement Form: This is acquired and completed at the DMV. Additionally, there are several different requirements depending on whether the car you wish to register is new or used or whether or not you purchased it in the state of North Carolina. For a comprehensive guide to each transaction type, the North Carolina DMV offers specific documentation requirements and associated fees. Remember that vehicles in North Carolina do require an annual emissions inspection and that other fees may apply. Additionally, the RTA tax only applies to vehicles registered in Wake, Durham, and Orange Counties, plus the Research Triangle; Randolph County has a $1 tax for the Piedmont Authority for Regional Transportation Tax. If you're just planning on staying in the state for an extended work project or family emergency, you may consider getting a temporary vehicle registration to make sure your car is fully covered while you're temporarily living in North Carolina. Temporary registration can be obtained for travel, transfers, inspections, and sales of vehicles and last for 10 days. These are also convenient if your car fails to pass its initial inspection because the DMV will issue you a 10-day permit to make necessary repairs and get the vehicle inspected again. Once you get your official annual state registration, this temporary permit is nullified.